Creme liquid spirit wax for timber floors, enhances the natural look of timber. “Fills and feeds the grain”. Liquid wax floor polish for wooden floors. Spirit based paste or liquid waxes have been used to protect, enhance and beautify timber floors for hundreds of years. Originally soft beeswax was applied and polished by hand to bring out the natural lustre over floors that were pre-sealed with Tung oil. With the advent of polishing machines in the 1920’s, harder, more durable synthetic waxes were added to provide more water resistance and were more easily cleaned with water based cleaners. Spirit waxes virtually disappeared from use when clear alkyd and urethane sealers appeared in the market in the fifty’s and sixty’s. Due to the low maintenance and gloss of these finishes they have dominated the timber floor market. Only dance floors and halls taking advantage of the easy repairability and “slip control” allowed by the spirit wax system. Since the mid 90’s when timber flooring really “took off” in the marketplace wax finishing has grown immensely in popularity, particularly in older buildings where originality and “antique” appearance really looks superb. Traditionally Tung oil is used to penetrate, seal and waterproof the floor with spirit wax filling the grain on hardwoods and providing lustre and smooth, even , easily maintained appearance on all solid timber floors. 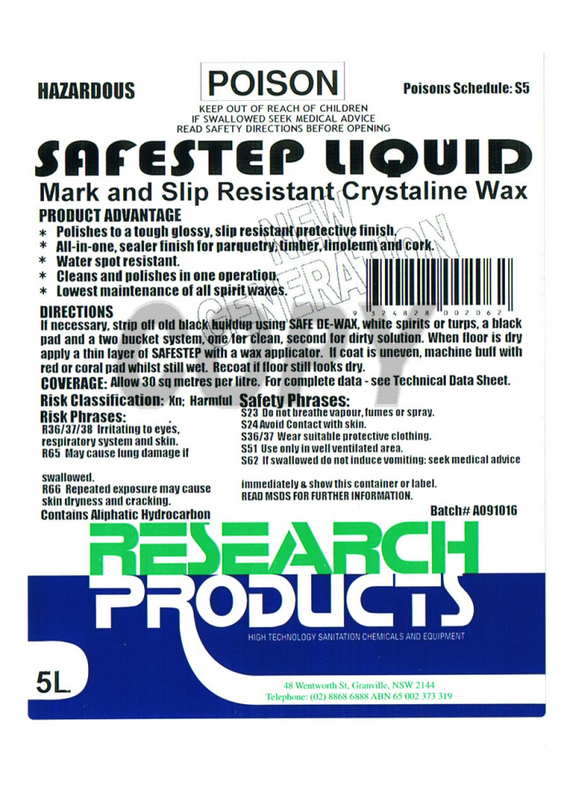 Safestep is a modern adaptation of the traditional spirit wax finish. It combines soft synthetic waxes for easy scratch mark removal by buffing plus harder waxes that improve detergent spill resistance and gloss. Thixotropic formulation allows the product to be significantly thinned by shaking the container. This thinning effect can provide the user with a more easy spread, with only minimal amounts of turpentine or white spirit additions for mop application in Winter. In summer, normally the addition of solvent is not required. Two coats application over Tung oil is normally all that is required to fill grain and build a warm even gloss. Easily adjusted for slip resistance. For dance floors you require minimal thickness (less wax). This gives a faster finish. Thicker applications give less gloss and greater slip resistance in walkways and flooring not used as a dance floor. It’s totally opposite to what you would expect. Sanding with a sandscreen disc to a fine finish (180 to 220 grit) ensures the floor has minimal raised grain. A slow speed machine is ideal for fine sanding. Apply two coats of Tung Oil Seal after all dust is carefully vacuumed away. Tung oil impregnates deep into the timber to help waterproof and provide a flexible sealant. Apply the first coat liberally with a lambs wool applicator (refer to Research Products Tung Oil Seal datasheet). Under normal drying conditions Tung Oil Seal will be dry enough to apply the second coat within 10 hours. Prior to second coat of Tung Oil, smooth any raised grain with a wine coloured smoothing pad (de nibbing pad) and vacuum thoroughly. Because Tung Oil Seal is a spirit based product, it may be coated with a spirit based wax much sooner than a water based finish. It is not necessary for the Research Products Tung Oil to fully cure unlike other brands of tung oil that contain modifying resins. Shake container to reduce viscosity or alternately sit the container in very hot water to liquefy and allow easy spreadability. Use a clean dry mop to apply the first coat across the direction of the grain using the ferrule to push the finish onto the floor in a tight figure of eight pattern. Apply completely to edges and allow to touch dry in 20 to 30 minutes, depending on thickness of the coat. Use the same method to apply the second coat, this time apply down the grain (in the same direction as the planks). Keep the second coat away from the skirting board by 200 mm to prevent edge buildup. Allow to dry thoroughly and buff the floor using a 300-400 RPM buffer and a tan or white soft pad to build gloss and smooth out the finish. If the floor is still hungry looking, a third coat may be required. A third coat may also be required if a slower, more slip resistant floor is required. Normal maintenance of a Safestep coated floor is to use the hot damp mop method weekly with a daily burnishing and dust mopping to remove harmful grit from the surface. Normally very soft floor pads are used as these remove marks and scuffs easily (tan or white). If brushes are used an older bassine brush that has had prior use and is clean, gives the best result. A JAVA/Bassine blend brush offers the best results overall and cleans the surface as well as removing marks and scuffs. Hot damp mopping with a neutral cleaner like Supastar diluted 1 part to 80 parts water is normally enough to remove surface soilage. Do not at anytime wet mop (flood mop) the floor as this can cause water marking and whitening of the wax finish. If floor is clean but showing traffic lane wear or is dry in appearance a single coat can be applied after cutting back with a red pad. Apply exactly as described above in 1 st coat application. If the floor has darkened with bound-in dirt in the wax film it is time to restore the surface with a deep clean. This is a very simple process where Safestep is diluted with mineral turps by about 30% and applied with a clean mop and heavily rubbed over the surface. A two bucket system must be used for this process as you are effectively removing the dirt and squeezing it into the second bucket. Change the wax/turps mix if it becomes heavily soiled and this is required when you see the dirt being redeposited or if the floor becomes streaky. Apply a second coat after buffing the first coat with a red pad whilst still slightly damp. (Usually within 15 minutes of cleaning) The red pad will remove any residual soil not removed by the mop. A second coat may be required to build gloss and fill the grain with protective Safestep wax. This is normally never required and is only used if you are changing to a water based timber sealer (DAYLIGHT EXPRESS) or a water based floor polish (DAZZLER). To remove a wax double bucket mop with pure turps or white spirit. Ensure you change your 1 st turps bucket frequently to ensure no carry over wax. Check the floor (in a small area) for compatibility or “pulling” prior to applying with the new finish when the floor is totally dry. If pulling occurs you will require a second turps strip.